MIX dressing ingredients in small bowl. RESERVE and REFRIGERATE 6 center slices from eggs for garnish. CHOP remaining eggs. COMBINE chopped eggs, avocados, tomato, onion and parsley in large bowl; TOSS gently to mix. ADD dressing and STIR gently just until ingredients are evenly coated with dressing. REFRIGERATE at least 1 hour to blend flavors. 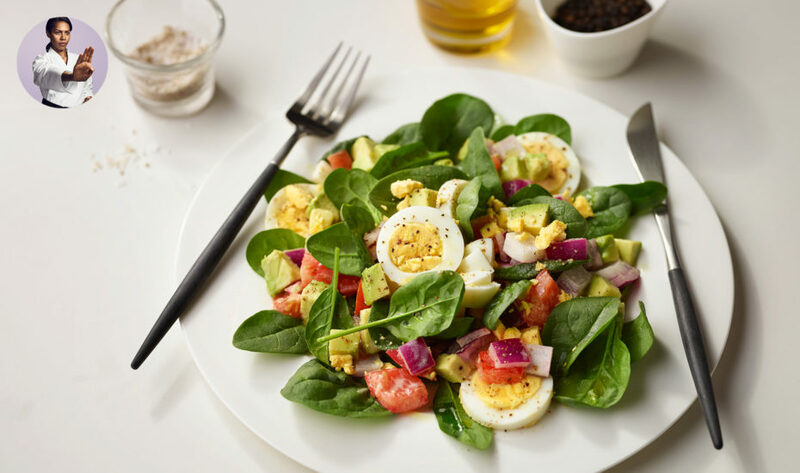 SERVE on spinach leaves, TOPPED with reserved egg slices. REMOVE from burner. COVER pan. LET EGGS STAND in hot water about 15 minutes for large eggs (12 minutes for medium eggs; 18 minutes for extra-large eggs). DRAIN immediately cool completely under cold running water or in bowl of ice water, then REFRIGERATE.